The house Fermoyle is a nice house with beautiful views, near Cloghane on Brandon Bay on the North Side of the Peninsula. John Hickson acquired Fermoyle in 1712, having previously settled at the adjacent lands of Tierbrin earlier in that year. He married Mary Rice, although there seems to a possibility that it was Susan Fitzgerald. (Can anyone provide proof?) About 1740 he gave the lands of Fermoyle to his eldest son, Christopher, to his second son, John, he gave Stradbally, to George he gave Gowlane and to the fourth son, James, Farrandalogue, Tierbrin. Christopher died there on 24th February 1751/2. His son, Robert Christopher, who married his first cousin, Mary Hickson in 1770 passed it on to his son, Robert Conway Hickson (born 25th November 1812). Robert married Jane Theresa O'Hara on 20th August 1841 and they had eight children. Burke's Peerage records that George Archibald Erskine Hickson was the fourth child (born 21st November 1854 in Fermoyle) and list him as "Hickson of Fermoyle, J.P., B.E., MICE". He was a Civil Engineer and participated in the construction of several railways in Co Kerry. He married Lina Maria Josephine Harte on 26th January 1884 in Tralee and they had two sons. Certainly the first, Robert Conway Hickson (1884-1962), was born in Fermoyle. He left Fermoyle ca 1920 to go abroad and died in Bangor, Wales. The residence is now owned by a German family who use it as a holiday home. The 25 acre gardens are well looked after. From Tralee (Trá Lí) take the road through Blennerville to Camp and continue along the same road (R560). Pass the turnings to Castlegregory, continue through Stradbally, pass the turning marked "Golf" towards the Connor Pass. Take the next turn right downhill, indicated by a sign to "Crutch's". 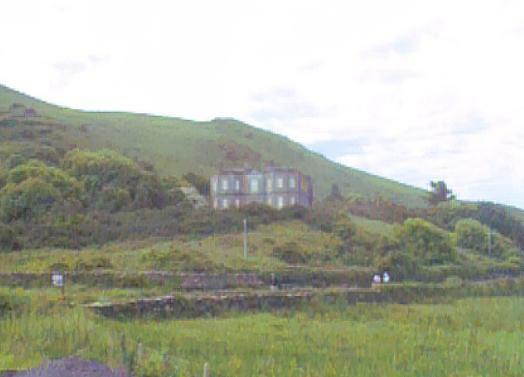 Fermoyle House is about half a mile past Crutch's Hillville House Hotel on the left, opposite an entrance to the beach.